When I started out making beads I was very concerned with making sure my shaping was good and my beads were nice and smoothly rounded. That was great, they were pretty beads and they sold. Unfortunately, when I made jewelry out of nice smooth round beads I found the pieces sort of boring. I like jewelry that invites touch. I incorporate a lot of different shapes in my pieces whether it is pressed Czech glass, gemstone chips, crystals, or different shapes of metal beads I like variety in the texture of my pieces. When I was using nice smooth focal beads I found that because the focus of the piece was boring texturally the rest of the piece just didn’t have the touchability that I was trying to achieve with the piece. That’s when I decided to attempt to bring in texture to my beads. I found that the beads I would incorporate bumps, swirls, and various other texture techniques into didn’t always look good, but the ones that did made jewelry that I found much more interesting to myself. These two pictures show a set of beads I added texture to and the bracelet and earring set that I created from them. I think this set looks great and would not look nearly as nice without the twist and dots. 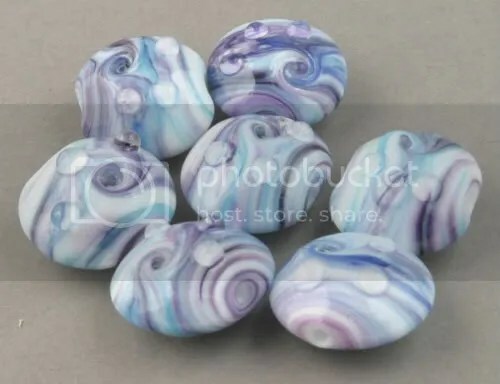 I hope you agree.When I started out making beads I was very concerned with making sure my shaping was good and my beads were nice and smoothly rounded. That was great, they were pretty beads and they sold. Unfortunately, when I made jewelry out of nice smooth round beads I found the pieces sort of boring. 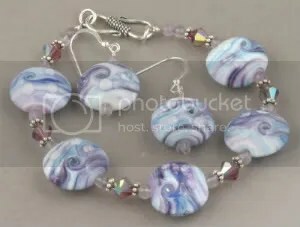 These two pictures show a set of beads I added texture to and the bracelet and earring set that I created from them. I think this set looks great and would not look nearly as nice without the twist and dots. I hope you agree. It is the emotional or rather spiritual texture of a human experience that is of primary concern to me. I deal in intangibles: soul whispers, light filled vistas, wordless revelations. They inform and guide the tiny shards of glass under my hands into shapes and forms. How do I translate experiences of deep quiet into glass artwork imbued with the same kind of calm? the veins of grainy green and blue running through the mostly red glass; the tiny air bubbles trapped under semi-transparent layer of liquidy icy white; the silky mauve coming through and overwhelming the otherwise heavy chocolate sheets of glass just because I cut too narrow of a piece… Then you add light, and more textural details come into view! and lose myself in a tiny kingdom of just one piece at a time. Have you ever looked closely at gemstones? They are like small worlds with their own character and each is unique in its patterns, shape and internal beauty. Whilst texture often only relates to the ‘feel’ I can often get the effect of texture from the look of a stone. The pattern of the stone, perhaps it is orbicular, banded or variegated. 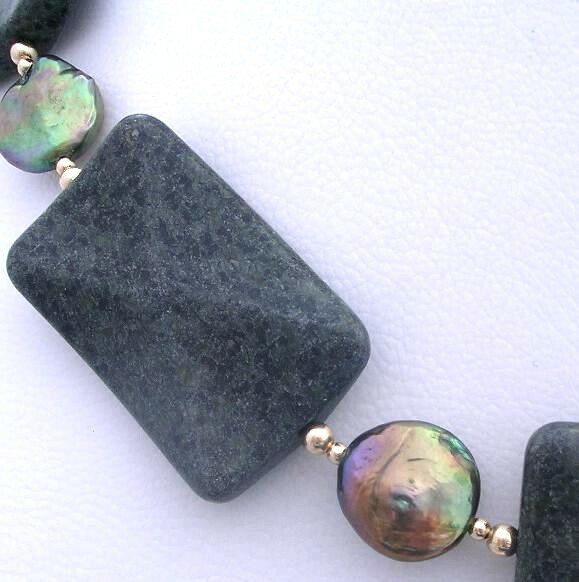 The stone could be transparent, translucent or opaque. The colour may be solid or shaded. All of these factors build to a visual texture of depth even though you know the actual surface will be cool and smooth. This ability makes jewellery very tactile. People want to FEEL it. There are stones that do have a different surface texture of course. Lava, for example is aerated and pitted. Some jaspers feel almost like cold velvet. Tumbled stones are smooth but may have pits and bumps across their surface. Faceted stones are often hard and almost sharp along their edges. Pearls and organic gemstones such as amber and shell, have beautiful surface textures caused directly by nature, even though they may be more fully revealed by man’s intervention. Adding levels of textural interest into jewellery is possible by mixing the smooth with rough, the dark with the light, the patterns with the plain, lustrous with matte. Be adventurous and experiment – you never know what brilliant amalgamation could emerge. One of the amazing things about glass is the ability to alter light. Glass can transmit, bounce or reflect light. Who doesn’t love a good suncatcher in the window? The magic of sunbeams dancing about a room is fascinating. 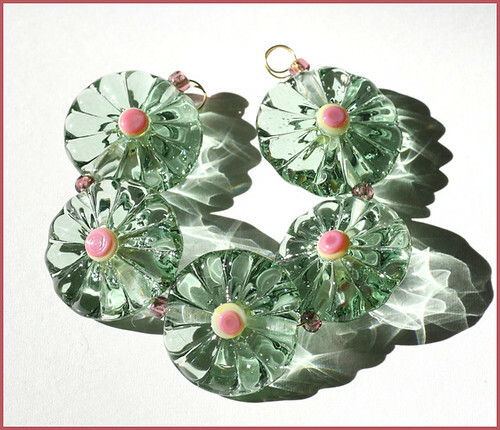 To create light altering beads I employ texture. Not only can texture send light flying in all directions, but it can produce a look that begs to be touched. Adding depth to my beads is a challenge I enjoy. Using a varitey of tools, I can manipulate glass in sculptural ways. The beads can bounce light as well as take on an interesting shape. Texture in glass is not only a feeling, but a look. Silky smooth glass can also appear to have texture. A mixture of transparant and opaque glass is a subtle way to create depth. Creating with glass offers possiblity and challenge. 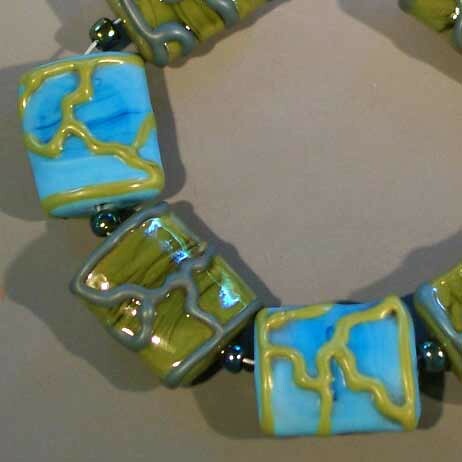 Employing the concept of texture helps add dimension and interest in glass beads. Focus on texture in your next work and see where it leads you. Texture is one of those things that transports a beautiful piece into a really interesting, eye-catching piece. While the eye may skim over color, texture grabs the senses, making you go from “that’s pretty” to “wow, that’s amazing!”. Texture makes you want to pick up a piece, touch it, turn it over in your hands. Texture makes the ordinary extraordinary. It gives your piece a unique signature. So how do you add texture to your piece? You could add knots of fiber. 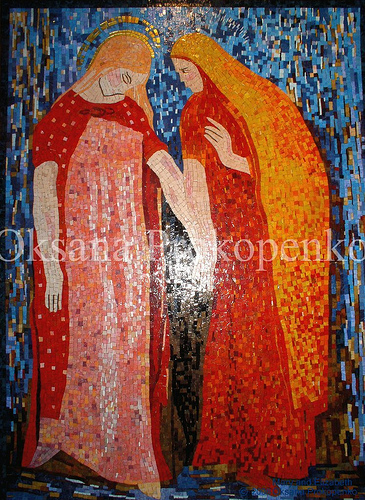 You could frequently, in the same piece, change the sizes of the beads. 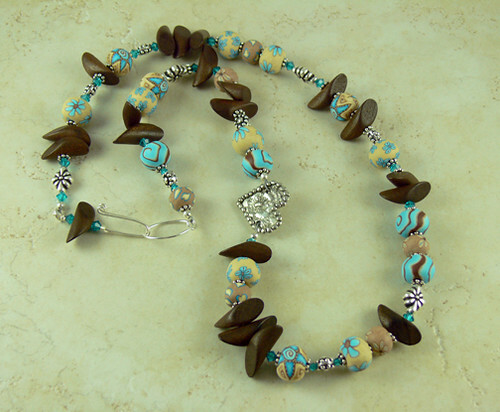 You could add wood beads to a mix of clay and crystal. 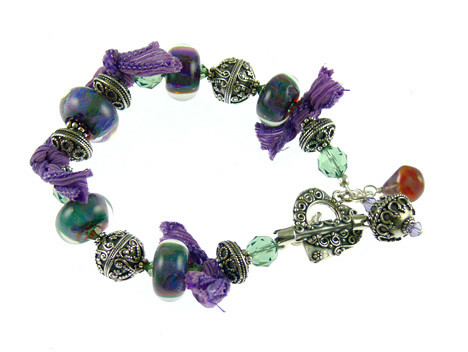 You can add lots of charms and dangles to a simple strand of beads. One of the best designers in the business is Stephanie Sersich. Her work is the epitome of a textural playground. She is constantly mixing random beads together and using fibers to create some of my favorite works of art. You can visit her site at www.sssbeads.com. 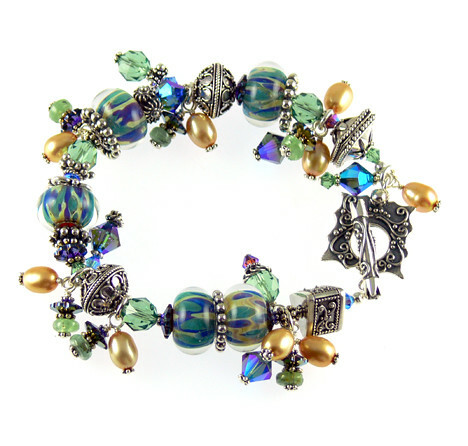 When creating your next piece of jewelry, gather all of the beads you would normally use. Then, paw through all your goodies and look for something that isn’t the same shape or feel from your “set” beads. 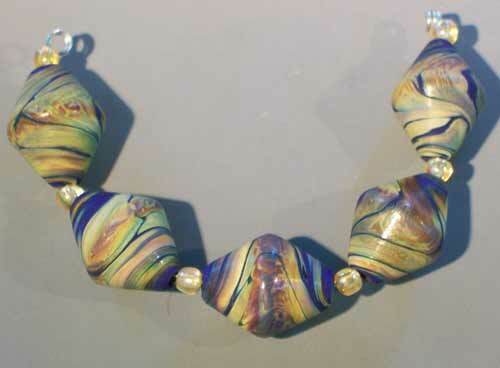 I have been a full time lampwork bead maker since January of 2005. Since that time I have etched only a handful of my beads. Etching beads is fairly simple, you either dip them in an acid etching solution or you can tumble them in rock tumbler with some silicon carbide. So far I have only tried the acid etching method. 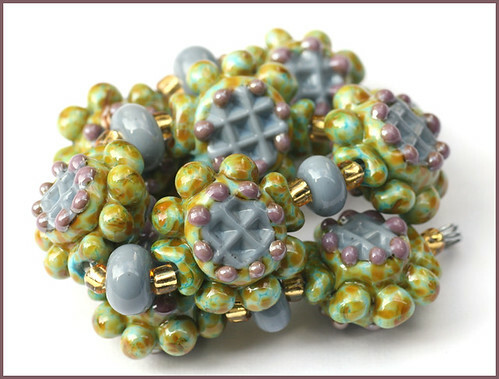 In the beginning, I just loved the way etched beads looked; so silky and matte. I was dying to get my hands on some etching liquid. Then I actually saw some etched beads in person and got to touch them. I was repelled by the feel of etched beads. It felt like a chalk board to me. Disappointment set in. Nearly a year went by, with me dead set against etching anything. I just could not get over that feeling. 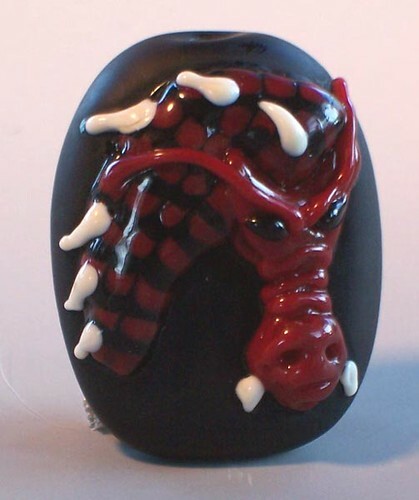 Then one day I received a seahorse bead by Kimberly Affleck. She makes the most wonderful beads. Mine was etched. It had the softest feel to it. I was shocked and amazed. No chalk board feel. How in the world does she do that? She told me, but I don’t want to divulge her trade secret, if it is a secret. Another method, I have since learned that is that if neutralize your acid etched beads in milk after etching them, it gives a soft silky smooth finish. Susan Sheehan passed on that tidbit to me. It really works too. So now I am able to etch my beads without fear. That still doesn’t answer the question to etch or not though does it? There are some designs that I feel benefit from etching. One of my favorite things to do is to etch only the base of my dragon beads. It gives texture to the base, but still the dragon shines on. To do this I paint clear nail polish over the area I want to stay shiny and then dip the whole bead in the etching solution. After I am done, it just peels right off and keeps that area unetched. Etching is also good for colors that like to take on metallic sheens, or metals that come to the surface while working the glass in the flame, such as moretti copper green or turquoise. The etching solution will take off the metal deposits. 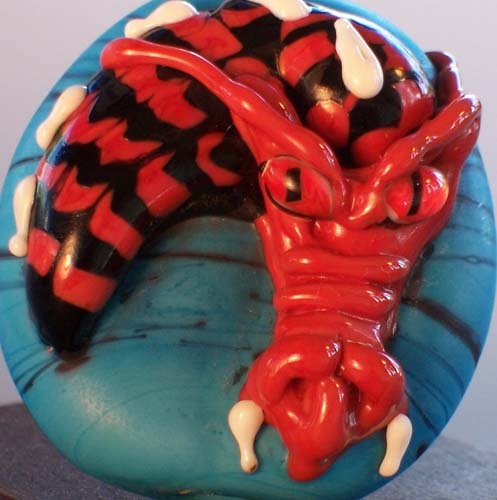 This dragon has a turquoise base. 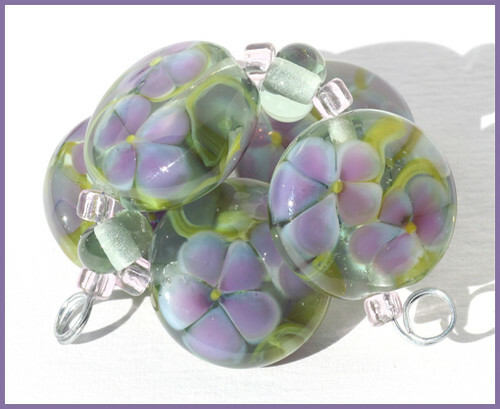 Etching can brighten up or soften the look of a bead. It can change the colors very dramatically and can sometimes turn a ugly bead into something beautiful. So a good rule is, if I don’t like my bead, try etching it. You never know what might happen.